You wouldn’t think apes to be within the purview of Mystery Inc., but when one of the apes is Prymaul, the evil, talking Nazi vampire gorilla. He teams up Monsieur Mallah of the Brotherhood of Evil. Together, they have recruited an army of apes from DC’s extensive history. 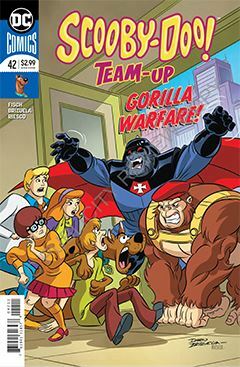 So the Scoobies fight fire with fire, bringing in their own allies such as Congo Bill, Detective Chimp and Sam Simeon of Angel & the Ape. There really isn’t a mystery to be solved, but there is a puzzle in how to defat such a staggering force of evil. One might think Scooby-Doo Team-Up is a joke of a book; maybe so. But it serves a purpose in providing a forum for maintaining the copyright to DC’s more obscure characters. Perhaps some of them should lapse, but it’s been the strategy for many team-up titles since the beginning. So for long-time fans of comic book history, it can be a special treat to be reunited with old friends.